Well, I don't...quite know what to make of this. 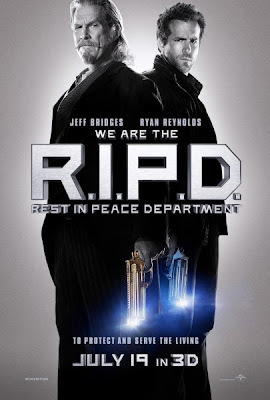 On the one hand, this trailer for the action comedy R.I.P.D. looks like Men in Black if agents J and K were both dead. On the other? It's Ryan Reynolds, who, if I may say, should be trying to attach himself to projects similar to his underrated performance in the 2010 drama, Buried, and not...this kind of thing. And, let's not forget, Oscar winner Jeff Bridges is playing the J to his K. It seems he hasn't been living up to his full potential lately either. Robert Schwentke (Red) directed the film, and screenwriter Phil Hay (Clash of the Titans) adapted the film from Peter M. Lenkov's graphic novel. Oh, it looks like it has funny moments too. So there's that. R.I.P.D. releases in theaters July 19th. Wow! Trailer for RIPD looks cool but like a MEN IN BLACK movie from a parallel universe!! or MEN IN BLACK RIPD OFF! MIB ripoff in the worst way, they even use some of tag line from the original movie. Still could be mindless fun if nothing better is showing.